Apparently, the odds of getting an O-Pee-Chee autograph aren't that great. But that never stopped me from getting the card I want. 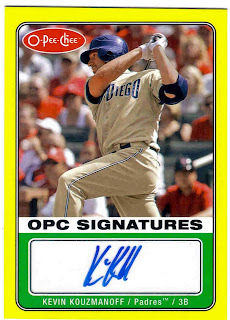 I picked up this Kevin Kouzmanoff OPC auto for $1 (I think $4 shipped) and it actually is one of my favorite autos of his. The card isn't too flashy and it's plain without being boring. The yellow border gives it just a little style and you can tell it's different than the base cards because it's glossy. The colors are actually so ugly that I like it. Maybe I'm looking a little too much into the card, but it's one of my new favorite Kouz cards. It definitely looks like something right out of the 70s. Could your favorite player be obnoxious? Sunday Question: What product would you buy? This is how you know you have a problem. Swap your wife and your collection? !